As central Dublin goes, Clontarf is a relatively young village. Until the mid 19th century it was a rural seaside estate arrayed around the Vernon family's Clontarf Castle. That, and a jerry-built shellfish gathering and fish curing settlement close to the waterfront. This means the house at No17 Vernon Avenue has something of a mystery about its origins. Because despite an architectural style that is definitely late 19th century, both it and the adjoining house appear to be standing alone in green space on early 19th century maps of the area. This would put both among the first larger homes constructed in the Clontarf area when Vernon Avenue, the kernel of modern settlement in the village, was just beginning to emerge from its origins as a fish curing settlement. The "Sheds" fishing village, was initially, as the name suggests, a series of precarious cabins with roughly- constructed curing sheds running down to the corner where Connolly's Bar (also known as The Shed) now stands. Impoverished families made a scant living fishing, oyster collecting and processing their catches here. It was the late 19th century before the Sheds vanished and development of upmarket homes began in earnest. Forward to the 21st century and Canadian couple Connor and Amanda Doyle moved to Ireland, initially to an apartment. But as their family grew, they began looking for a larger property. Amanda says: "We moved into Clontarf shortly after becoming parents in 2008 as it reminded us quite a bit of our youth in Vancouver, living near the sea with lots of green space nearby and the seafront promenade, Bull island and St Anne's Park. After our family expanded we had two young boys running wild in our apartment and so by 2011 we started to look for a place where our boys would have access to a back garden and which could be made bright and open plan to maximise daylight." The property crash was at its most devastating and they managed to acquire rundown No17 for a bargain €670,000. Located close to the coast road end of Vernon Avenue and a few doors up from "The Shed," the house, which was once known as Ormond Hall, hadn't been occupied for 10 years. The Doyles hired an architect and got the builders in to get the house back on its feet. Tantalisingly, photos from the renovation works show what seems to be the frame of a much older 18th century style external door with a flat and wide set fan light, discovered as the basement was being cleared. "We were told that this was the first house on the road," says Amanda. "That the Vernons themselves might have owned it." Indeed back then it was typical for larger rural homes (Clontarf was rural then) to get updates and makeovers which involved redoing the entire frontage and sometimes even turning the house back to front. Then another mystery emerged - the couple managed to get permission only after showing Dublin City Council that the late Victorian frontage we see today came much later - building details from the 1911 census showed a building with a completely different window count to the front than the existing structure. This puts the current frontage post 1911. 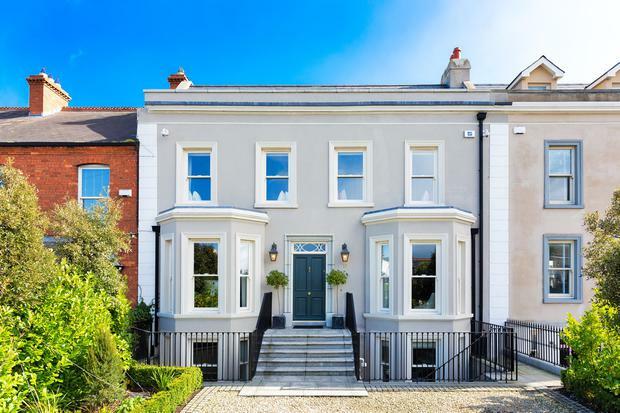 Amanda adds: "When we found 17 Vernon Avenue it was being sold directly by the previous owners and we immediately fell in love with high ceilinged drawing room, long garden and its proximity to the heart of Clontarf village. The house at that time was around 3,300 sq ft but we thought that with some luck we could build something which was around 5,000 sq ft where the top three floors would be quite traditional and have a basement which you could do a lot of cool things with. And the "cool things" included a substantial private cinema in the basement with its own wine bar, a dedicated home gym, a fantasy children's playroom and myriad technology that was far ahead of its time. 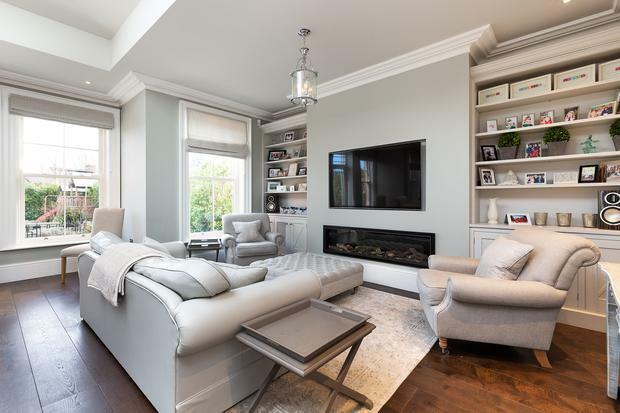 For example, each room features wall panels which currently contain eight different pre-programed moods for that room's lighting, designed and set for the personal needs of the Doyles and can be reset for new owners. Controls automatically change the blinds and curtains to mix daylight admission/privacy alongside the electric lighting. The sound speakers are concealed in the walls and ceilings, utilising a special sound conductive plaster which in effect becomes the speakers. Literally, the walls can talk, and sing. Amanda adds: "We hired Andrew Stewart Architects and Lohan & Donnelly Engineers with a remit of restoring the existing house, adding an attic extension for a master suite over a floor of kids bedrooms and also adding a two-story extension to the rear to provide for a modern bright family room." The project took 20 months. "While everyone we hired was great, we must say that Andrew was particularly amazing with both his design and communication." The lighting is by Wink of Wicklow, which has supplied over 30 different light fitting types from opulent crystal chandelier, to brass/copper Victorian and early 20th century deco to subtle spots. And almost every fixture, fitting and furnishing is near or at the top of its range. There's underfloor heating at basement and ground level and the timber flooring is either parquet mahogany or trunk-stained oak. Despite being finished back in 2012, this house looks like it was completed yesterday. Out back in a garden and patio made for entertaining are two barbecue areas, one with a substantial rectangular gas fire which equally warms all seated patio guests. In a hidden garden to the rear are three raised and irrigated vegetable beds for home food growing. At almost 5,300 sq ft, the home that has emerged has the floor space of almost five average three-bed family homes within its walls. There are now 24 rooms in this property. It's nerve centre is without a doubt the very large kitchen/dining and family room running the entire width of the house. With oak trunk floors at one end there is a modern wall-mounted and enclosed gas fire, a range of hand painted and bespoke kitchen cabinets by Design House, a pantry kitchen, a 1.1 metre natural gas stove which has a professional wok burner, two built in wall ovens, plate warming drawers and a substantial island unit. There's a coffee bar and two full-sized fridge and freezer units by SubZero. Appliances are by Miele. The ground floor also includes a pantry, a guest wc, a traditional dark wood study with mahogany floor and panel work, and a drawing room with marble chimney piece and a chandelier. There are four bedrooms upstairs, the master with walk-in dressing room and full ensuite. There's a fifth guest bedroom and designer mud room in the basement. No17's true origins are still a mystery but it's now for someone else to solve as the Doyles are now moving back to Canada to be closer to extended family. 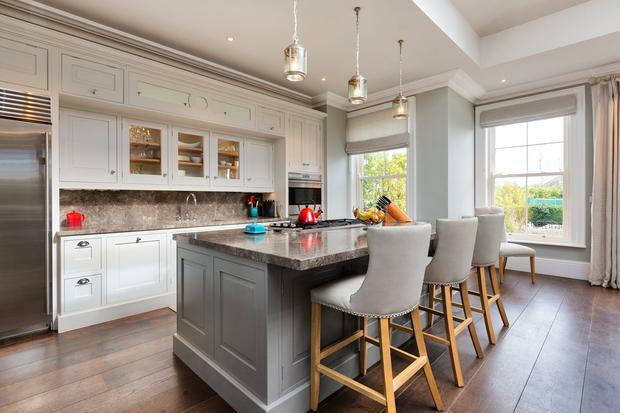 The house is now for sale for €3.25m through Coldwell Banker's inernational Global Luxury division and handled by Karen Mulvaney who adds: "In the ultra competitive Clontarf market, a house of this period modernised to a true international standard is a rarity indeed." Amanda adds: "We think we've created a wonderful space here to raise a family in Dublin and hopefully the next owners will feel the same way too!"